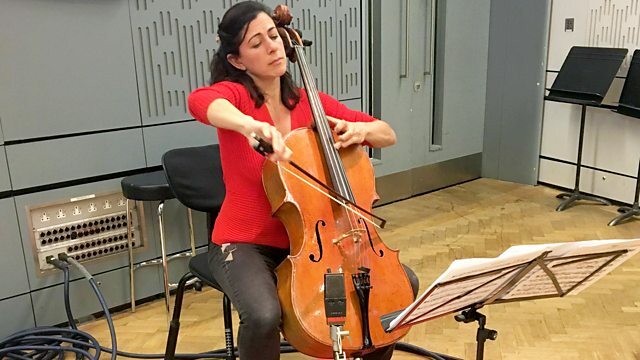 Katie Derham presents, with live music from cellist Natalie Clein and pianist Yeol Eum Son, and slide guitarist Pandit Debashish Bhattacharya. Plus conductor Jose Serebrier. Ensemble: Concerto Málaga. Conductor: José Serebrier. Singer: Carole Farley. Orchestra: London Philharmonic Orchestra. Conductor: José Serebrier. Performer: Alexander Romanovsky. Orchestra: Russian National Orchestra. Conductor: José Serebrier. Bridge - PIano Sonata etc Kathryn Stott. Singer: Cynthia Clarey. Orchestra: London Philharmonic Orchestra. Conductor: Sir Simon Rattle. Performer: Anthony Robson. Performer: Catherine Latham. Orchestra: Collegium Musicum 90. Director: Simon Standage. Performer: Esther Abrami. Performer: Iyad Sughayer. Beethoven: Symphonies 1-9: Harnoncourt, Chamber Orchestra of Europe.